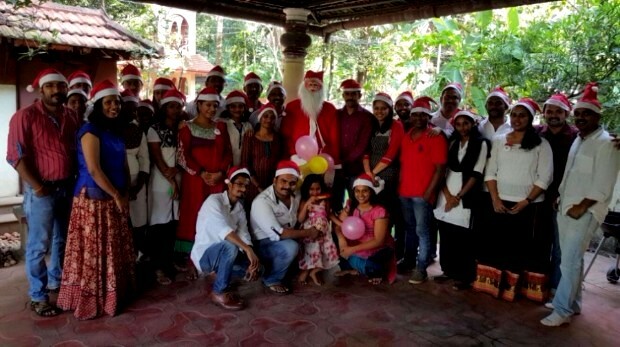 CRS Technologies celebrated 2015 Christmas with great pomp and grandeur. It was a festive atmosphere in the office, filled with joy and excitement throughout the day. The fun and celebrations began in the morning with decorations and rehearsals of shows by the respective groups. The office was abuzz with preparations for the program and everyone was in a cheerful holiday spirit. The Christmas program officially started at 2 in the afternoon. It was kicked off with Santa Claus, accompanied by the carol group singing Jingle Bells. Next was a group photo of the entire CRS Technologies team. It was difficult to get the entire team in one frame, but it was finally somehow managed. This was followed by a gifting ceremony to Christmas friends whom everyone had pre-picked from a lot earlier in the week. Gifts and smiles of all shapes and sizes were exchanged. The program moved on with some amazing song and dance performances by the team. The highlight of the evening was a comedy skit, complete with a Maharaja and his royally comedic court proceedings. As planned, we started our BBQ event at around 5PM, starting with scrumptious charcoal flame grilled veggies for the vegetarian staff and ending with a delicious chicken BBQ. The event was complemented by a lively Antakshari competition. The celebrations went on into the night with more food, music and festivities and it was clear everyone had a great time.